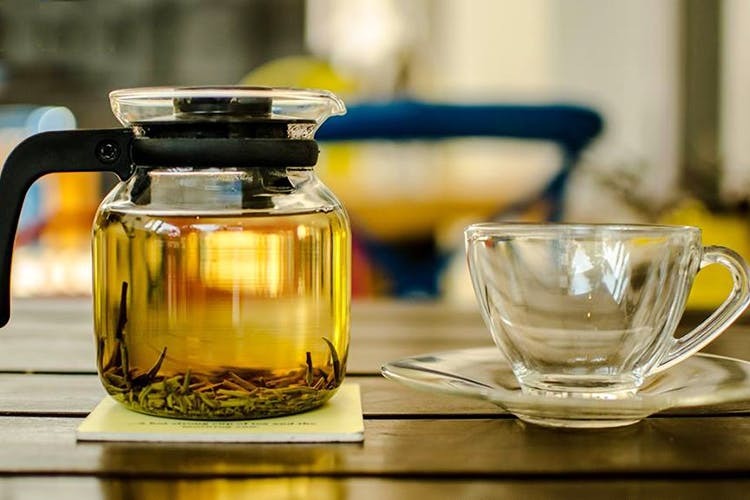 Tea Brew is perfect if you’re looking for a spot of calm and quiet in the otherwise busy Indiranagar area. They’re also super wallet-friendly! Chilled out ambience, good crowd and fast service. Tucked in a slightly more remote corner of Indiranagar, Tea Brew is located in a now-converted bungalow. There’s a spacious verandah with ample seating that’s the smoker’s section, and an inside seating area, too. The cafe is quite cute, with pops of pastel colours, hanging plants and an overall homely feel. We were in more of a snack-y mood, so my friends and I ordered an Oreo Milkshake, a Hot Chocolate, and a Lemongrass Tea to drink, as well as a plate of French fries and Steamed Chicken Momos. The drinks came first, and none of us were really impressed — the milkshake was suspiciously warm, and when we asked them to remedy it they simply added ice. The tea was weak and flavourless. The hot chocolate, however, was excellent — it was smooth, creamy and very chocolatey! The food was decent. The French fries were extra crispy which we didn’t mind all that much. However, they were doused with so much salt and pepper, we had to shake each fry before eating it! The momos were decent — they weren’t as flavourful as we had hoped, but nonetheless quite palatable. We loved the ambience and excellent service despite the substandard food. The prices were also quite low, so it wasn’t too much of a blow to our wallets. We’d probably think twice before heading back, though!